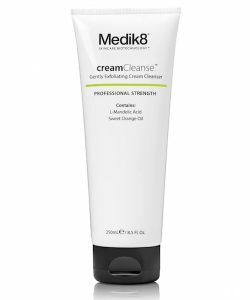 View cart “Medik8 creamCleanse” has been added to your cart. The ultimate set for all your brightening/ anti pigmentation needs! Comes with exfoliating cleanser, brightening serum, day and night moisturiser. Prep, correct and protect your skin! While stocks last. Grab your before it runs out! A revitalising skincare system targeting all signs of visible ageing. Improved version. Even faster & better results! Maximum strength blemish treatment infused on very soft textured cotton pads. A revolutionary weekly skincare kit that captures the essence of Medik8’s best-selling r-Retinoate® Youth Activating Serum in an intense 4-week eye treatment. The kit includes high-performance vitamin A derivative, retinyl retinoate, in a serum designed for the delicate eye area, paired with the most advanced patch technologies available for synergistic results. Weeks 1 and 3 use the ground-breaking Dissolvable Micro-channel Patches, covered with fine micro-points formed from pure hyaluronic acid. These pain-free micro-points create tiny channels into the skin; enhancing the penetration of the retinyl retinoate serum, as well as firming the skin around the delicate under-eye area. On weeks 2 and 4 of the treatment, Bio-cellulose Eye Patches infuse the skin with a veil of hyaluronic acid to deeply hydrate and nourish for a smoother, refreshed looking complexion. Perfect post treatment eg. peels, needling, lasers..
An intensive post-treatment moisturiser that speeds up the skin recovery process. Sulphates Free. Parabens Free. Soap Free.